In his fantastical tale, Rip Van Winkle, Washington Irving told of how the ghosts of Captain Henry Hudson and his crew appeared once every twenty years in the Catskill mountains, across the river from here. According to the story, the Captain could then "...keep a guardian eye on the river and the great city called by his name." named the permanent capital of New York by just one vote. 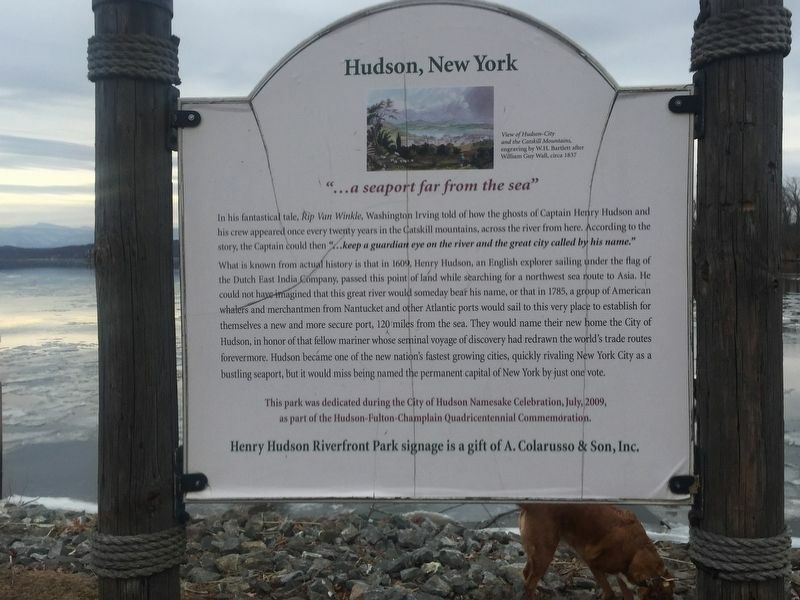 Henry Hudson Riverfront Park signage is a gift of A. Colarusso & Son, Inc.
Erected 2009 by City of Hudson. Location. 42° 15.273′ N, 73° 47.986′ W. Marker is in Hudson, New York, in Columbia County. Touch for map. In Riverfront Park. 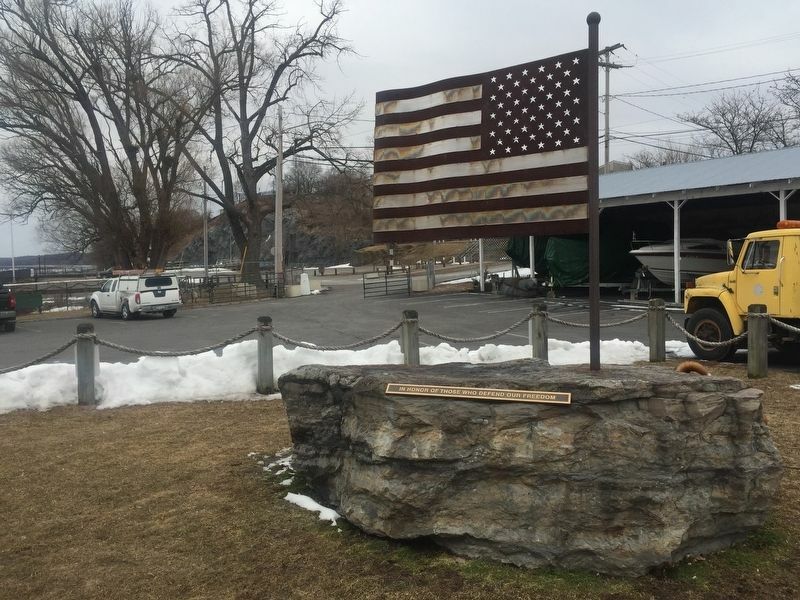 Marker is in this post office area: Hudson NY 12534, United States of America. Touch for directions. Other nearby markers. At least 8 other markers are within walking distance of this marker. Operation Desert Storm (approx. 0.6 miles away); Korea (approx. 0.6 miles away); WWII Memorial (approx. 0.6 miles away); Vietnam (approx. 0.6 miles away); Davis Hall (approx. 0.6 miles away); Northrup House (approx. 0.6 miles away); Jan Van Loon House (approx. 0.6 miles away); Athens Veterans Memorial (approx. 0.7 miles away). Touch for a list and map of all markers in Hudson. More. Search the internet for Hudson, New York. Credits. This page was last revised on March 6, 2019. This page originally submitted on March 4, 2019, by Steve Stoessel of Niskayuna, New York. This page has been viewed 50 times since then. 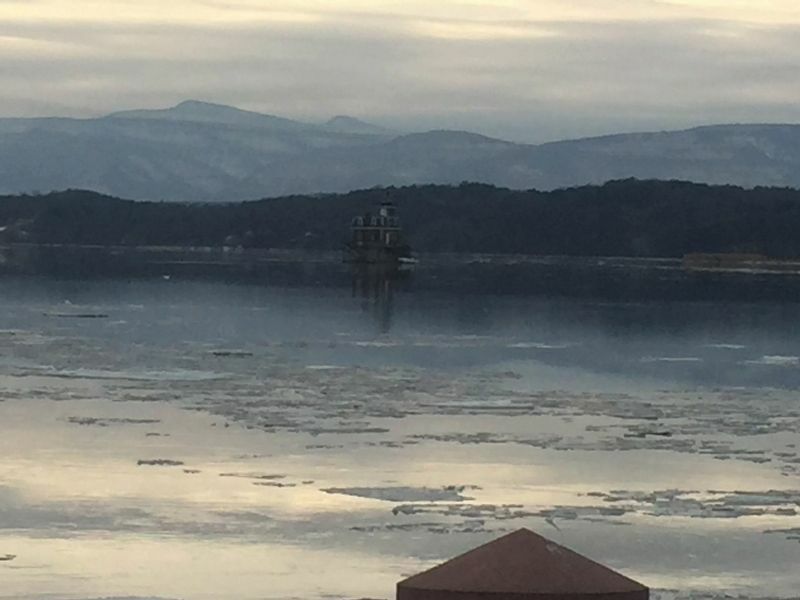 Photos: 1. submitted on March 4, 2019, by Steve Stoessel of Niskayuna, New York. 2, 3. submitted on March 5, 2019, by Steve Stoessel of Niskayuna, New York. • Andrew Ruppenstein was the editor who published this page.